The Green Girl and Lexa with her new rear tire headed up to Santa Monica for a long ride Sunday morning. In an attempt to avoid the saddle pain I experienced on my first long ride, I layered my running shorts over my new padded Pearl Izumi Sugar Shorts. I parked at a meter just north of Venice Beach and headed south on The Strand. 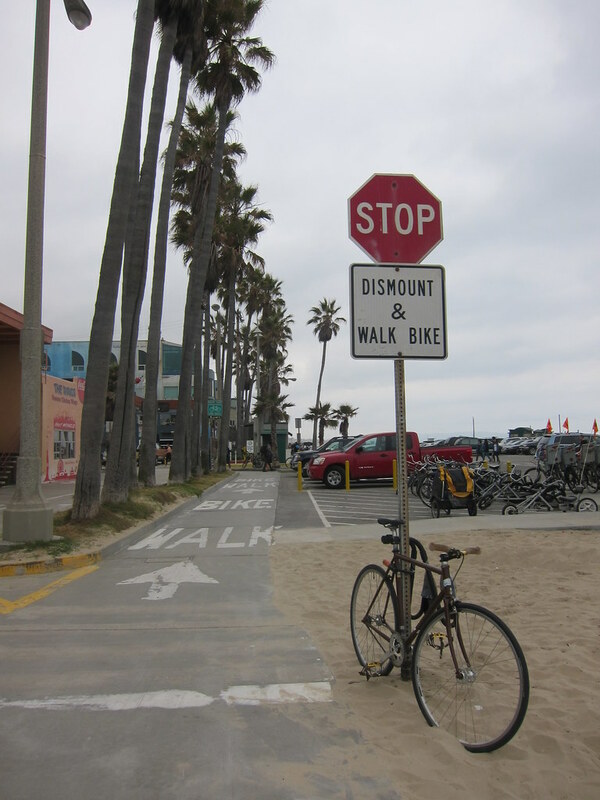 The Santa Monica portion of The Strand is approximately 8.5 miles. I had assumed I would be able to follow The Strand all the way down to Manhattan Beach where I often run after work. Unfortunately for Lexa and me, bicycle traffic is not allowed on some portions of The Strand and there was no way for us to go that far south without having to go on the street. 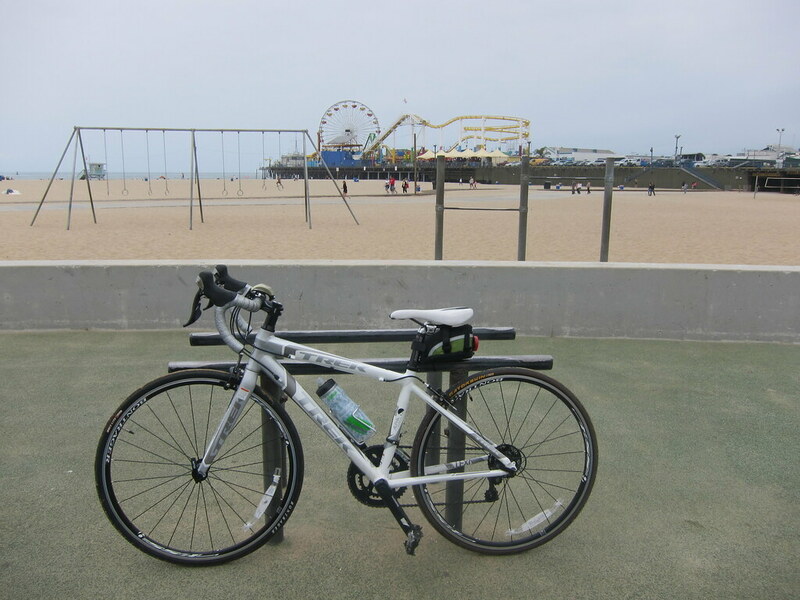 Instead, I just opted to go up and down the continuous Santa Monica portion. We were able to go as far north as Will Rogers State Beach in Pacific Palisades before we turned around and headed back to Venice Beach. At one point, I did make a feeble attempt to ride on Pacific Coast Highway but the cars got way too close to me and I quickly changed my mind. 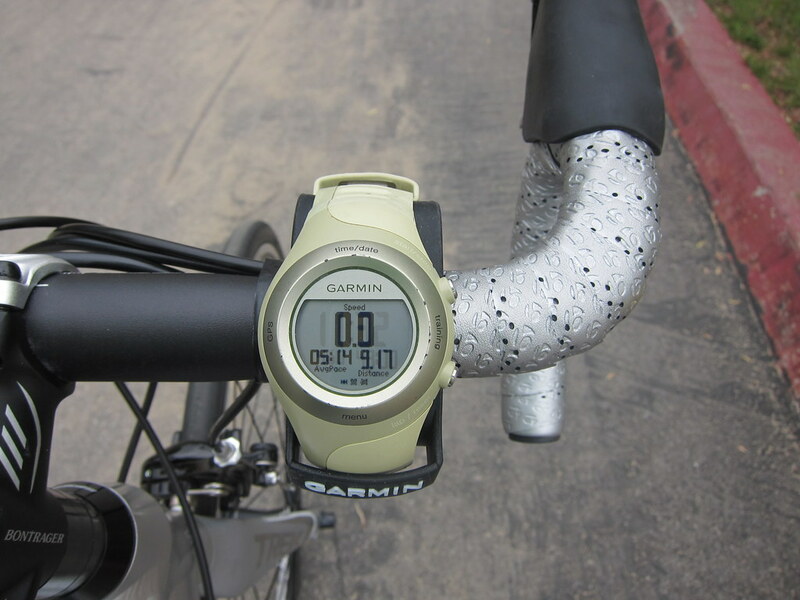 This was our first ride with Mr. Green Garmin attached to the handlebars with the Garmin Forerunner Bicycle Mount. It was a lot easier to look down to see my speed and distance since I'm not coordinated enough to take my hands off Lexa while I'm riding. 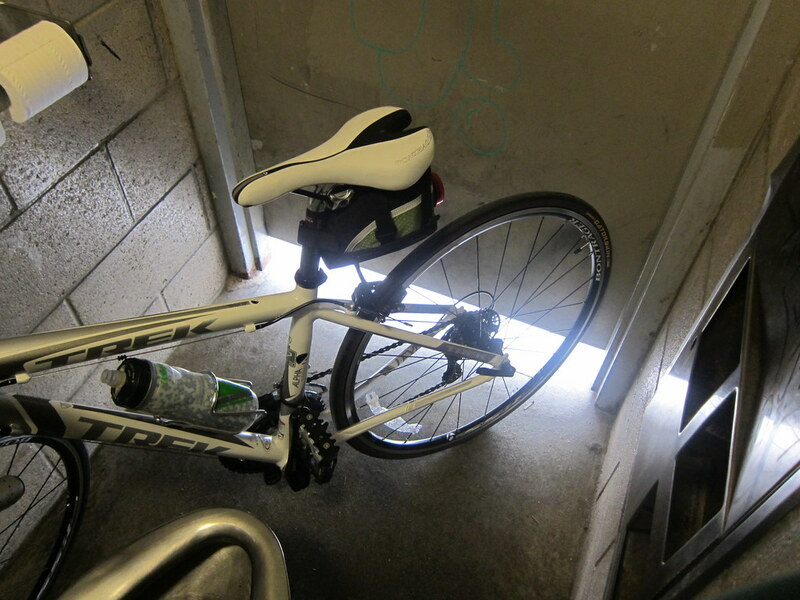 One advantage to having the world's smallest road bike is that Lexa can fit into a bathroom stall with me. I must admit the padded shorts made a world of difference. We ended up doing 25 miles and I didn't experience any discomfort. I'm cautiously optimistic about the Green Girl's cycling career. Mounting the Garmin on the bike is a terrific idea! Glad you had a great ride with Lexa. I see many more in your future! Great ride! I love that you have the smallest road bike in the world! I need to ask Jill how short you really are. :) I see some great rides for you and Lexa in the future. So funny - you and I have the same size frame and everyone calls my bike the mini bike. That is too funny she fits in a bathroom stall! You are tiny! I have never worn bike shorts but I'm thinking I should get around to buying some this year. I'm sure it would make everything MUCH nicer on long rides. Congrats on your first long ride! Unfortunately, as a cyclist, you're going to learn a lot about lack of bike access and disrespect on the roads. Just take it in stride and be safe. Bike shorts are a great investment. They come in a variety of thicknesses and you can also get gel seats.